The delicious, easy-to-follow healthy recipes in this book will not only help restore your good health, keep blood sugar levels stable, lose weight, and enjoy life again. Healthy foods, healthy recipes promote balanced blood sugar levels, healthy cholesterol and triglyceride levels and even contain antioxidants and other phytochemicals and special nutrients that fight off cancer. Eating good food supports the body's natural ability to heal itself! Learn Dr. Beth's delicious recipe secrets on how to lower the glycemic index of all the foods you were told to avoid! Mashed potatoes Desserts Pie Bread even Chocolate! Find out the truth about eggs, milk, coffee and other foods you were told lies about! You won't believe you could eat so good and be so healthy for eating it!!! NEW!!! 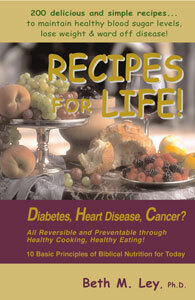 2012 Edition with over 40 additional recipes featured in "Recipes for Life with Dr. Beth" seen on Direct TV (ch. 378) Saturdays at 12:30pm CT/1:30pm ET. This is a very complete book that not only contains recipes, but also a great deal of information on the importance of eating biblically and how it can lead to a healthier lifestyle. On the recipe side it contains more than 100 recipes for every kind of meal from soups to ice cream and even bread! If you want to heal yourself naturally while eating the way God intended to I can't recommend this book enough, it's that good. This is, fortunately, not a diet book. There is a welcome lack of emphasis on counting calories and macronutrients that I am sure all of us are tired of seeing. This book is in a class all its own. It refreshingly reads more like an informative guide to healthy food alternatives to the processed and adulterated. Contained within the book, are concepts conveyed which aptly explain why we should eat whole, organic, non-GMO foods in layman's terms. Dr. Beth Ley clearly illustrates the concepts and reasons for eating biblically, with supportive verses of scripture. This is not a book touting religion. On the contrary, it is a book touting the practice of eating the way we were meant to eat, using the bible as a historical benchmark. While one reads this book, it is important to always remember this book is not intended to beat people up who do not eat biblically; or even that if you don't eat biblically that God will hate you or send you to hell. The throughpoint of this book is to show you what you should and should not eat, backed up by scripture and common sense that explains exactly why - leaving no room for confusion or difficulty in understanding the ideas conveyed. Also, while reading this book you will find a welcome lack of technical dietary rhetoric we are all so used to putting up with. I believe that Dr. Beth purposefully wrote this book in layman's terms so that anyone can understand the ideas she conveys within. This book has it all. Completel with a supplemental Q&A section, sample recipes, as well as a list of foods that benefit you one way or multiple ways. Also included are food lists showing the reader what foods one should avoid (and why) and what foods are safe (and why). This book will prove an invaluable resource as an all-in-one guide to an optimally functioning human body by eating the foods as God intended them to be consumed. I'm glad I got this ebook! No regrets! Highly recommended! Thanks for a great book, Dr. Beth! "The key is to NOT be overwhelmed at how bad you think your diet is, but to committ to starting an improvement plan. Then, start with one thing...just one thing!" "Health problems largely unheard of 100 years ago are reaching epidemic levels: ADD/ADHD, autism, Alzheimer's, Irritable Bowel, Chronic Fatigue, and on and on. All of these can be associated to diet - omega-3 fatty acids deficiency, lack of fiber, minerals and an abundance of man-made CHEMICALS that do not belong in the body." "The United States has the worst health status (life expectancy, morbidity, obesity and infant mortality) of any of the industrialized nations, yet we spend the most money on 'healthcare' and take the most pharmaceuticals. Americans are getting sicker and sicker while taking more and more drugs!" "It's NOT too expensive to eat healthy! Consider this: A trip to a large fast food chain restaurant costs over $17.00 for four sandwiches and four 'regular fries.' For $17.00 after removing all the packaging you get 2.80 pounds, net weight, of "food." This is over $6.00 per pound, which is triple the average price of organic foods in a typical health food store. For some reason most people are under the false impression that fast food is cheap, and organic food is expensive!"